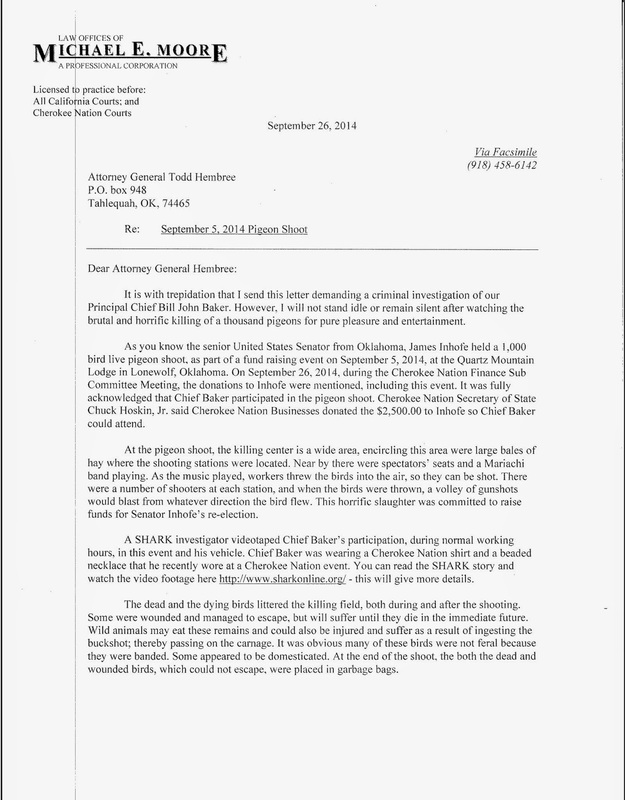 Cherokee Nation citizen, Michael E. Moore, has submitted a letter to Cherokee Nation Attorney General, Todd Hembree, demanding an investigation into Principal Chief Baker's recent participation in a Pigeon Shoot fundraiser for US Senator from Oklahoma. James Inhofe. 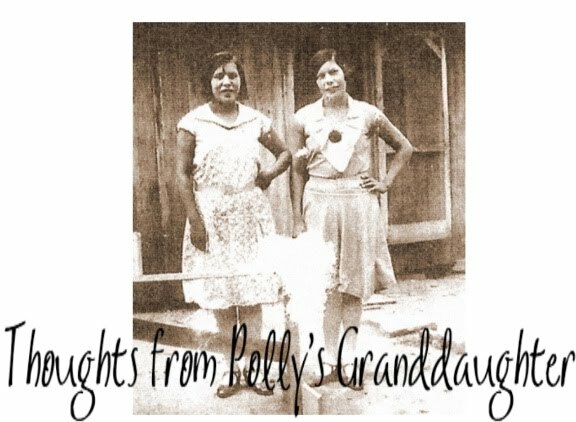 Moore states Baker's participation occurred during Cherokee Nation work hours, while Baker was wearing a Cherokee Nation shirt and driving a Cherokee Nation vehicle. Moore also states that he believes Baker has violated Cherokee Nation code, Title 21, Section 1685, our "injury to animals" law. Moore asked that Hembree recuse himself and appoint an impartial prosecutor or grand jury to hear the evidence and determine if charges should be filed against Chief Baker. 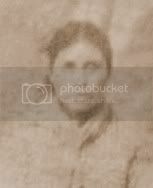 Moore is licensed to practice law in the Cherokee Nation and is well versed in Cherokee Nation law. 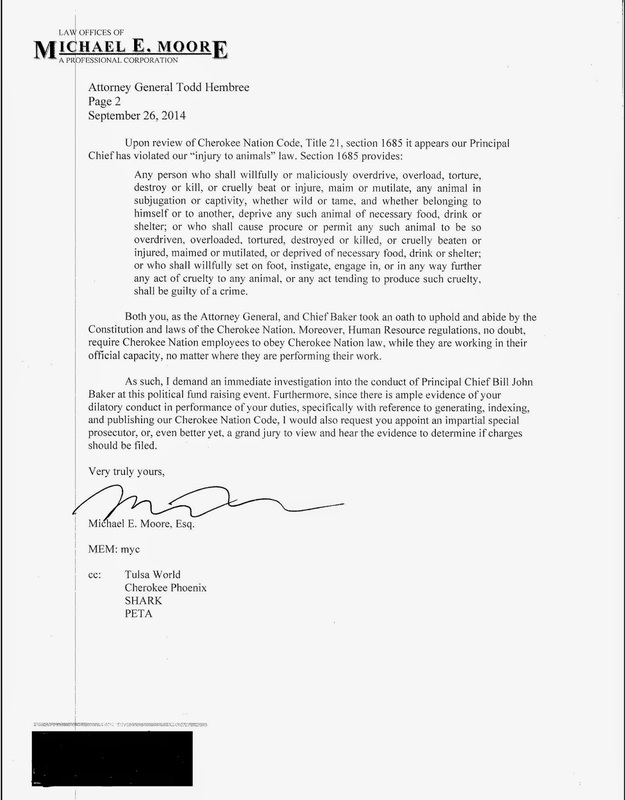 You can read his full letter submitted to Cherokee Nation AG, Todd Hembree, below. *Posted with permission from Michael E. Moore. Thanks Twila and congrats to Michael Moore for standing up to cruelty even when it isn't easy.